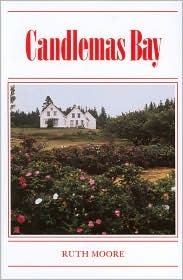 The Ellis family was a well known and respected family in Candlemas Bay, ME for many generations. Nathaniel Ellis settled it when he was just 19. Grampie, Jebron Ellis, is the last of the old line. His son, Guy, is an alcoholic. Guy’s son Jeb is made from the old mould and wants to learn everything he can about his ancestors and their livelihood -fishing. Guy does nothing to help him. Grampie takes him under his wing. Highly in debt, and owing Grampie a large debt for a loan to get a new modern fishing boat, Guy moved his family of 8 in with Grampie and Guy’s three sisters. Tensions are high with sister Candy who thinks she rules the roost. Could there be a bit of insanity going on with her? A tragedy happens and everyones lives are forever changed. I loved, loved, loved this one of Ruth Moore’s books. I couldn’t put it down. I read it in two days. Ms. Moore is a master at communicating a place and a people, their thoughts, their talk, their geography. She takes you there to feel the spray of the ocean and feel the damp of the fog and smell the food cooking in the kitchen. This is the third of her books I’ve read, you can read the other two reviews here. I have 4 more of her books on the shelf to read and I’m hoping I can find the rest someday! This is a nice write up on Ruth Moore if your interested.